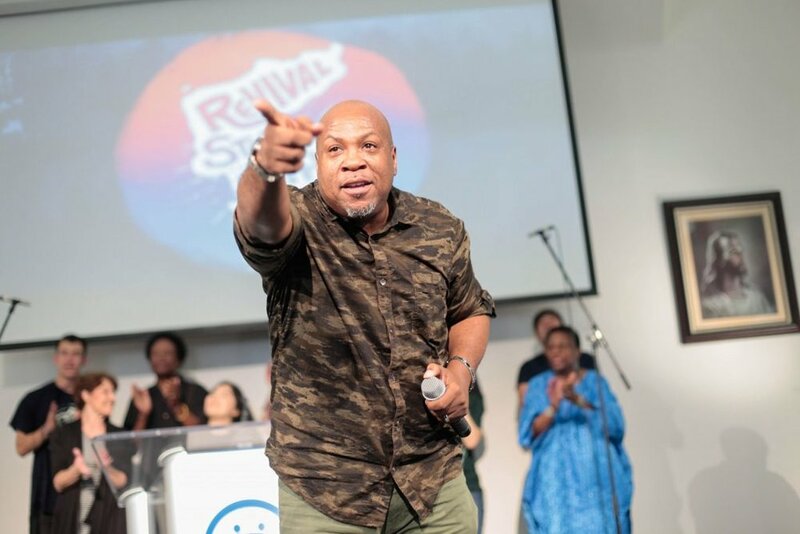 Based on the success of the Revival Starts With Me (RSWM) Rally at the City of Refuge on Dec. 16 2017, CARP Los Angeles (LA) and the American Clergy Leadership Conference (ACLC) teamed up again to host a second rally to continue to share the message and hope of revival. 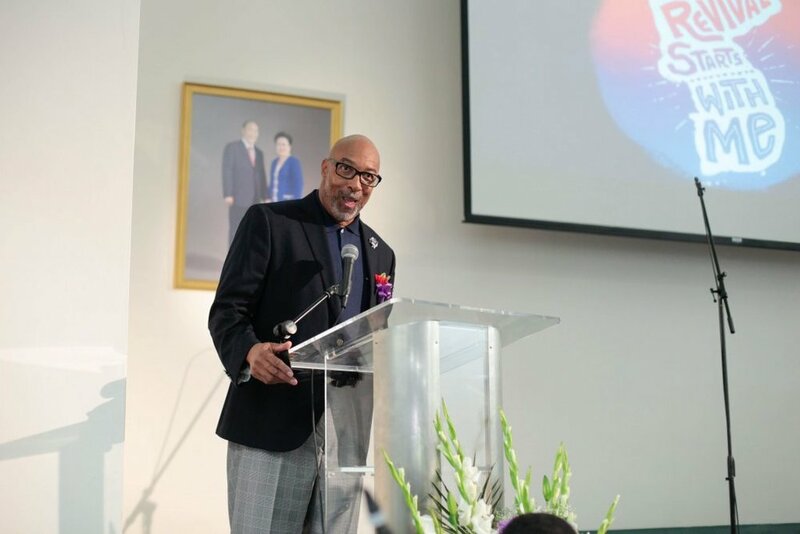 On April 7th, 2018, 300 people attended the second rally at the Los Angeles Family Church. The intention for this gathering was to build personal and intimate relationships with each of the participants and inspire them to become partners in making CARP’s vision a reality. CARP leaders visited 14 different churches to share the vision of RSWM. Like the last rally, we had two fronts of outreach. We invited our friends and chapters from our college campuses, and we asked our friends from ACLC and their church contacts to come out too. CARP chapters presented the vision and mission of the rally in their club meetings. Seven college and high school campuses and fourteen church leaders were represented at the April 7th rally. The host community, the Los Angeles Family Church, part of Family Federation of World Peace and Unification (FFWPU), also came in support. Patrick Bolton and his band brought incredible energy to the rally. Patrick Bolton, the Band Leader at City of Refuge, started the rally with some inspiring songs that demanded audience participation. The participants danced, sang, and shouted. It set an exciting and vibrant atmosphere! Rev. Young Tack Yang, the Senior Pastor of the Los Angeles Family Church, gave a few welcoming remarks before Sarah Takhar, Pasadena City College (PCC) CARP President, took the stage as the emcee for the event. Rev. Matthew Wheaton Jr. gave the opening prayer. Co-Chairman of ACLC LA, Dr. Nicholas Benson, gave the opening remarks, noting the diversity of crowd and the number of youth leaders who stepped up to make the rally happen. He was followed by Rev. Matthew Wheaton Jr. for the opening prayer. The audience joined hands for the opening prayer. Patrick Bolton gave an encore performance quieting the mood for a video introduction of the history of mission of the ‘Revival Starts With Me’ rallies, created by CARP Cypress member, Isaac Takeu. Joshua Holmes, CARP Cypress President, shared a personal revival testimony. CARP Cypress President, Joshua Holmes, shared his perspective as a college student with an impassioned speech about the state of division in each of us and related that to his own personal testimony and the RSWM mission statement. He also shared about the Founders of CARP, Father and Mother Moon, and their life testimony. He shared that they endured suffering and persecution and even imprisonment in concentration camps to share their message of peace and love. Joshua said he looks to them as role models and hopes to follow in their footsteps. Youngbok Gomez expresses the spirit of love and peace through his song. He was followed by local artist, Youngbok Gomez, who shared an original song, Letter from Heaven. Dr. JoAnna Schilling takes the stage! After that, Cypress College President, Dr. JoAnna Schilling, shared the collegiate administration perspective. Her speech was about the four values from Cypress College: Integrity, Excellence, Collegiality, and Inclusiveness, and how they related to RSWM. She expressed how happy and proud she was to be a part of a group of young people who are not only inspired, but make concrete steps to achieving their higher purpose. Bishop Noel Jones inspires the audience. Representing the church clergy present, Bishop Noel Jones gave a speech on the spiritual and Biblical perspective on division and the solutions. His words affirmed the mission of RSWM from a Christian perspective. The audience made new friends and deepened relationships in their pair share. After every speech, Sarah led the group in a pair share. The final discussion was about how they can apply what they heard after the rally. It was during these times the audience members were encouraged to share their hearts and make new friends. A former member of the Hyo Jin Moon Band, Matt Ishizuka performed with passion and fervor. The Los Angeles Family Band performed the song, My Pledge, which was written by former World CARP President, Hyo Jin Moon. Pastor Nisan Stewart and Takayo Hiraki share their reflections and a prayer. Then, Pastor Nisan Stewart shared his reflection with the audience, and CARP Cal State LA Member, Takayo Hiraki, led everyone in a unison prayer. CARP LA perform their show-stopper, Mujogeon, to close the rally. The LA Family Church Band concluded the event with an original song, We Are One, and accompanied CARP LA members who performed the Mujogeon dance. Kyosei Nagai, CARP ECC President, shares about CARP’s vision to interested students. The program then shifted to an interactive cafe experience called Vision Cafe. CARP, ACLC, the Universal Peace Federation (UPF), Women’s Federation for World Peace (WFWP), and other organizations set up booths to share what they’ve been doing and inspire the participants to connect. Food and drink were available as well as a photo booth and time for fellowship. It was an opportunity for everyone to feel connected to each other by striving for a higher purpose. Emcee, Sarah Takhar, and CARP Cypress Vice President, Ori Rodriguez, take a commemorative photo. The entire program lasted until 6pm. While the staff, cooks, ushers, and backstage members felt exhausted from preparing and hosting for two days, we all felt a sense of fulfillment that we were able to connect with so many people on a deeper level. Ushers greeted attendees at the entrance with little gifts for each of them! 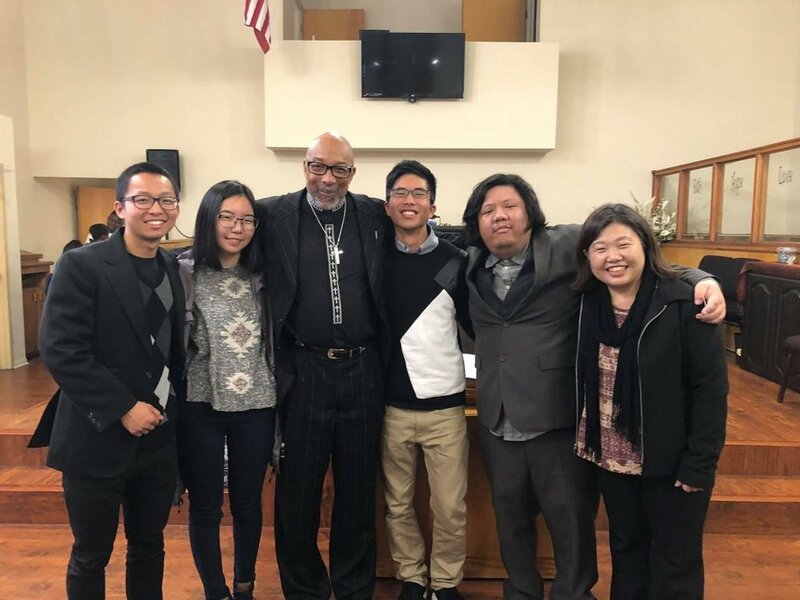 In inviting our campus faculty and our community’s church leaders, we were able to bridge a gap that had long since been separating our young people from faith and from our educators. CARP Cypress takes a photo with Dr. Schilling, Maha Afra (CARP Chapter Advisor), and CARP LA President, Jermaine Bishop Jr.
Moving forward, Cypress College wants to host us and Bishop Noel Jones on campus to share our message of peace and faith, a result of CARP Cypress’s work of raising the students, loving the faculty, and serving the campus. RSWM on April 7th was a call to action. It was an invitation to be part of something larger and build an ideal world together, starting with me. We plan to continue connecting to our new friends and family to create and make new programs that continue to strive for bigger and better. Stay in touch with the movement at Revival Starts With Me Facebook Page. Email us at rswm2020@gmail.com! To share your story, email jennifer@carplife.org. Older PostBay Area Seminar Level UP!